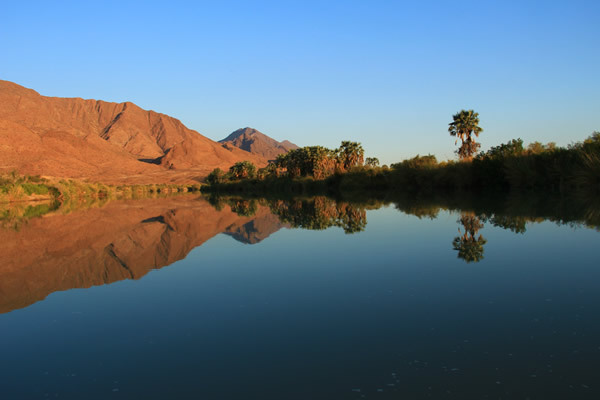 Okahirongo River Camp is the perfect catch. It’s an eco-friendly lodge wonderfully designed on a ridge which presents visitors with gasping views of the Kunene River. Keen fisherman find their happy place there. 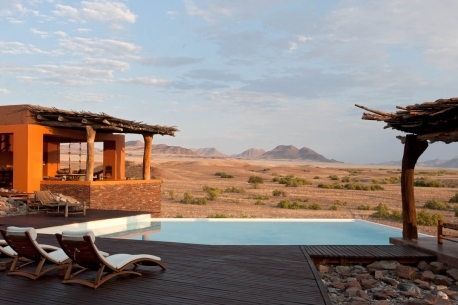 The camp crouches in the Marienfluss region in Namibia, cradled between two mountain ranges. It’s isolated, mesmerizing and the fish are waiting. 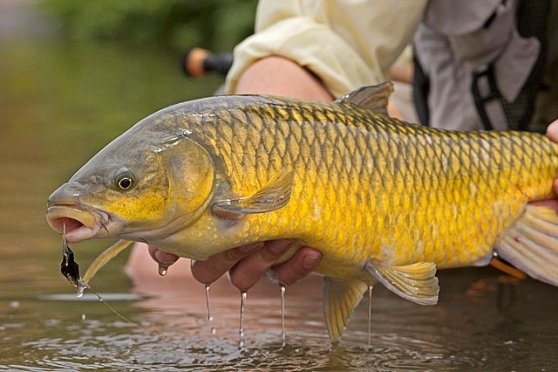 The camp claims that fishing in the Kunene River is at its best between May and December. Recent guests who have enjoyed conventional fishing have caught largemouth yellowfish, silver catfish, Tillapia and pike. Okahirongo River Camp also offers Fly Fishing. For those wanting to meet the fish a little further from camp and who are in the mood for an adventurous experience around that, fishing trips to the skeleton coast can be arranged. The trips consist of a scenic flight over the skeleton coast to Terrace Bay. Once in Terrace Bay, a vehicle takes guests on a dune drive on the way to the beach. A barbeque will be prepared on the beach whilst guests are fishing for Kabeljou, Steenbras, Galjoen and Blacktail. For the braver fishermen, sharks can also be caught. 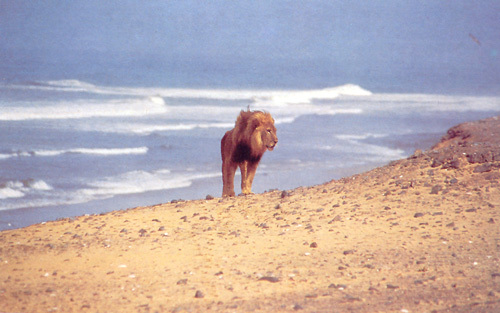 Namibia is following the fascinating expedition of a lonely lion named the Terrace Male. He walked all the way up the skeleton coast to the Kunene River and then swam across to Angola. The lion has now been reported as slowly making his way back to the Kunene River Mouth and everyone at Okahirongo is waiting in anticipation to see where and how the lion will cross the river. Visit www.desertlion.info for further updates. The lodge is embedded on a hill in the Kaokoland, called as one of the last true wilderness areas left on earth. The Kaokoveld is home to the nomadic Himba tribe as well as the rare desert adapted elephant, lion, black rhino and giraffe. 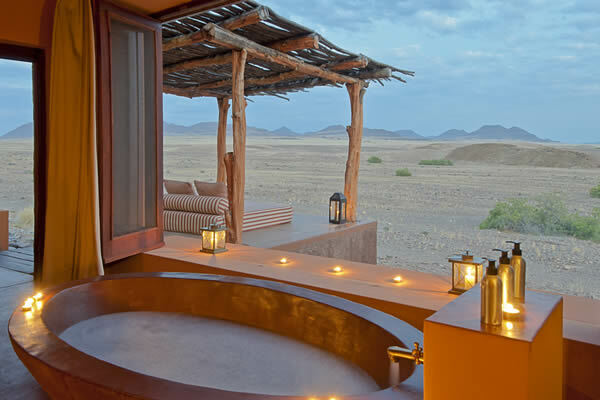 The lodge is located in the Purros Conservancy and is remote luxury epitomised. This very remote lodge belongs in an extra special category. It was not just the lodge, which is gorgeous, but the whole experience. The setting at the foot of a mountain looking out across desert and dunes to another mountain backdrop was one of the most beautiful settings of any lodge I’ve been to….We were fortunate to have great sightings of the desert adapted elephants, giraffes, and black rhinos with our guide Pollen. At night it was magical sitting around the fire pit with the most beautiful sky. We felt privileged to be a part of this. The lodge in on a small hill so you have a feeling of ‘great space’ all around. We stayed 2 nights and enjoyed every minute. The food has the Italian touch to it and so does the stylish way it is furnished. Everything tells you there is the attention to detail. We were taken on excursions on both days (day time and sun down excursions) accompanied by a very friendly and prepared guide. We even saw the rare Rhino! On returning to the lodge after the safaris, the lovely crystal clear blue swimming pool is there to refresh you! A 5 night package is on offer and includes stays at both Okahirongo Elephant Lodge and Okahirongo River Camp. Guests delve into an exploratory trip deep into Kaokoland when they are transferred between the two locations, discovering the lunar landscape and ancient volcanic mountains of the area. The opportunity to visit remote Himba villages and interact with the tribes people is possible too as guests explore the game-rich and spectacular scenery of the Hartmann Valley. Contact Okahirongo Elephant Lodge for more detail and to book.